At the Terminal bus of Santiago, ask to go to Talca (seventh region, departure each 10 minutes, about $ 3000, three hours trip). In Talca, take the bus to Armerillo, at the line 21 of the Terminal Regional (in front of the Pullman and Turbus one) (departure at 7:30 am, 9:30 am, 12:00 am, 12:30 am, 13:30 pm, 16:30 pm and 20:00 pm, about $ 800, one hour and a half trip). Go down after the Armerillo village, but before the "Puente de los Vientos", at the "Refugio del Tricahue" (ask the driver, he might know!). From Talca. About 69 km. Take the road to San Clemente-Paso Pehuenche. Pass by San Clemente, El Colorado, Paso Nevado, and take the road to Armerillo. Cross this little village, in direction of the "Puente de los Vientos". 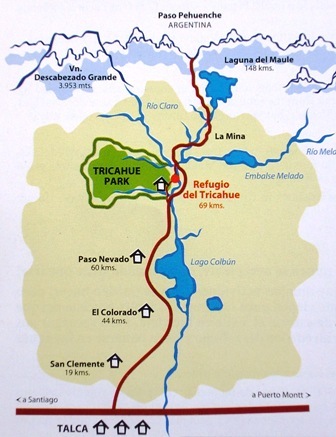 The "Refugio del Tricahue" is at about 1 km from the last houses of the village. It is indicated with a panel at your left. If you come from Argentina, there are about 100 km from the Paso Pehuenche. Follow in direction of Armerillo. The refuge is at about 500 meters of the "Puente de los Vientos" (very tight! ), above the Claro River. It is a beautiful trip if you come from Argentina by the Paso Pehuenche, only going down, along the Maule River, from its origin (be careful with the strong front wind at the end of the day!). From Talca, on the international road, follow to Armerillo as described above. From Linares-Colbun, there is a possibility to go along the South side of the Colbun Lake, but be careful, this is a very bad road!